CIMB TrustCapital Advisors (CIMB-TCA) has acquired a 12-storey office building in Canberra, Australia, for an estimated A$226 million (RM716 million). CIMB-TCA, a joint venture between CIMB Real Estate Sdn Bhd and Singapore-based TrustCapital Advisors Pte Ltd, bought 50 Marcus Clarke Street from Walker Corp. The property is described as A-grade and is said to be one of the largest, newest and best-built assets in Canberra, CIMB-TCA said in a statement yesterday. The property was constructed in 2011 and is on a long-term lease to the Commonwealth Government Department of Education, Employment and Workplace Relations. 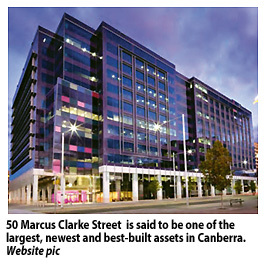 This is CIMB-TCA's third property investment in Australia after 469 LaTrobe Street and 850 Collins Street which are both in Melbourne. Over the past 12 months, CIMB-TCA has invested some A$450 million (RM1.43 billion). CIMB-TCA is a unique Asian-based fund established with the objective of investing in high-grade commercial office buildings in key cities of Australia. The fund's chairman Datuk Robert Cheim said that it will continue to take investors into the Australian real estate market and add value through sourcing, structuring, financing and ongoing asset management. Great job! I am really glad that I read this blog. It is worth every second of my time.